A brain biopsy is a procedure to remove a sample of abnormal tissue for examination under a microscope. The tissue cells taken during the biopsy can show what kind of brain lesion (abscess, tumor) is present and whether it is benign (not cancerous) or cancerous (malignant). Knowing the specific cell type helps doctors recommend a treatment plan. What is a brain biopsy? The purpose of a brain biopsy is to diagnose an abnormality seen on an MRI or CT scan by taking a sample of cells from the suspicious area. There are generally two kinds of biopsies: open biopsies and stereotactic needle biopsies. Figure 1. During a needle biopsy, a hollow needle is inserted into the lesion. Small biting instruments remove bits of tissue that are examined by a pathologist, who determines the exact tissue cell type. In an open biopsy, an incision is made in the skull and a small piece of tissue near the surface of the brain is removed. The tissue is sent to a pathologist, who examines it under a microscope and determines the type of disease. 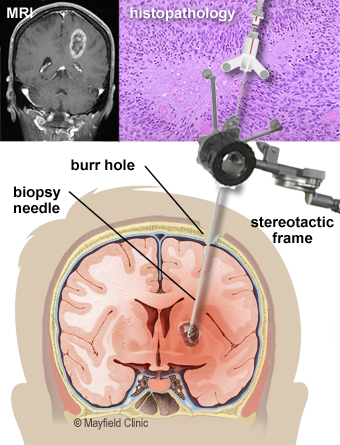 In a needle biopsy, a needle is used to access tumors or lesions that are deeper in the brain. During this procedure, a stereotactic frame is used to guide the needle into the brain and into the abnormal lesion or tumor (Fig. 1). Stereotactic guidance is like the GPS system used in your car. 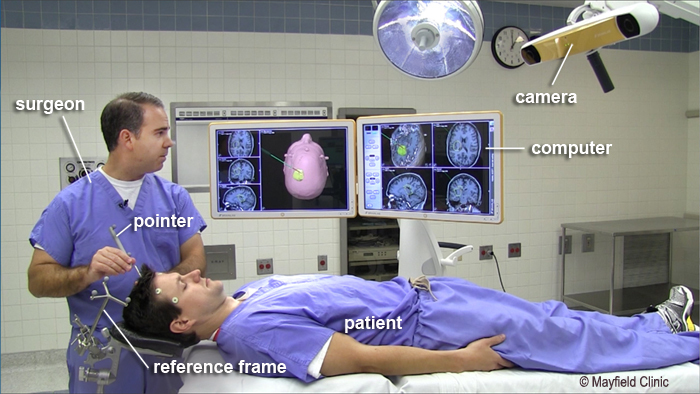 It is a navigation system based on your preoperative imaging scans. A neurosurgeon performs the biopsy surgery to obtain brain tissue samples. A physician called a neuropathologist examines the sample cells and performs a variety of tests to make a diagnosis of the tumor type and grade. This process takes 5 to 7 days before final results are known. In the doctor's office you will review the procedure with your neurosurgeon and have time to answer questions. Consent forms are signed and paperwork completed to inform the surgeon about your medical history (e.g., allergies, medicines, anesthesia reactions, previous surgeries). Several days before surgery, your primary care physician will conduct tests (e.g., chest x-ray, electrocardiogram, and blood work) to make sure that you are cleared for surgery. It is important that you discontinue all non-steroidal anti-inflammatory medicines (Naproxen, Advil, etc.) and blood thinners (Coumadin, heparin, aspirin, Plavix, etc. ), typically at least 1 week before surgery. An MRI is obtained the day of surgery or the day before. Fiducials (small markers) are placed on the forehead, behind the ears, and sometimes on the back of the head. The markers will help align the preoperative MRI to the image guidance system. The fiducial markers need to stay in place and not be moved or removed prior to surgery, or this can affect the accuracy of the scan. Do not eat or drink after midnight the night before surgery. On the morning of your biopsy, you may take certain medications as instructed by your doctor with a small sip of water. You will be given general anesthesia. Once you are asleep, your head will be placed in a fixation device that attaches to the table and holds your head in position during the procedure. Figure 2. During registration, the skin fiducials and infrared cameras correlate the real patient to the 3D computer model and function as a GPS to help your surgeon locate the lesion. Instruments are detected by the cameras and displayed on the computer model. The surgeon watches the biopsy needle on the computer screen in real-time as it is inserted to collect the samples. The preoperative MRI is "registered" to your scalp fiducials, and accuracy of registration is confirmed by checking landmarks on your head (Fig. 2). A plan for the biopsy is then made, and a small 1- to 2-inch incision is planned. A small amount of hair will be shaved along the incision line. Next, a small burr hole is drilled in the skull. Then, using the image guidance system, the biopsy needle is passed into the brain and into the abnormal lesion or tumor. Several small pieces of tissue are obtained and sent to the pathologist. Typically a frozen section, or initial review of the tissue, is performed during surgery. The surgeon waits for confirmation that the biopsy is in the correct location and that abnormal tissue has been removed. Once the procedure is completed, the needle is withdrawn and a small titanium plate is secured over the burr hole. The skin is closed with stitches, glue, or staples. After surgery you will be taken to the recovery room, where vital signs are monitored as you awaken from anesthesia. Once you are fully awake, you will be transferred to a neuroscience Intensive Care Unit (ICU) for close observation and monitoring. A nurse will check your pupils with a flashlight and ask questions, such as, "What is your name?" You will be frequently asked to move your arms, fingers, toes, and legs. You may experience nausea and headache after surgery. Symptoms following a biopsy are usually mild and well controlled with medication. After surgery, you may be given steroid medication to control brain swelling and anticonvulsant medication to prevent seizures. The medications will be gradually stopped as directed by your surgeon. In most cases, you will remain in the hospital overnight and discharged the next day. You will receive discharge instructions regarding activity level, wound care, medications, and follow-up appointments. Most patients can return to normal activity not long after the biopsy. At your postoperative visit, final pathology results and treatment options will be discussed. Any stitches or staples will be removed. No surgery is without risk, but biopsies are less invasive than open craniotomy surgeries for tumor removal. They also have fewer complications. Possible risks of a biopsy include bleeding, brain swelling, seizures, stroke, infection, blood clots, and reactions to anesthesia. Mayfield Brain & Spine treats more than 1,300 patients with brain tumors each year. Our specialists are capable of controlling many brain tumors with a combination of treatments, including chemotherapy, immunotherapy, surgery, implant therapy (radiation seeds), radiosurgery, and whole brain radiotherapy. We are affiliated with premier hospital systems in the Greater Cincinnati-Northern Kentucky Region. Our neurosurgeons collaborate with neuroradiologists, pathologists, medical oncologists, radiation oncologists, and neurointensivists. Together, we are capable of controlling many brain tumors with a combination of treatments, including chemotherapy, immunotherapy, surgery, implant therapy (radiation seeds), radiosurgery, and whole brain radiotherapy. Advances in technology give Mayfield's neurosurgeons unprecedented access to brain tumors. Image-guided systems enable us to navigate precisely in remote areas and to remove tumors with minimum impact to our patients. Intraoperative diagnostics, including the Mayfield MobileSCAN CT and intraoperative MRI, give up-to-date images of an operation and help surgeons confirm that every bit of tumor has been removed. Radiation technologies like Gamma Knife allow us to eradicate some tumors without making any incision at all.